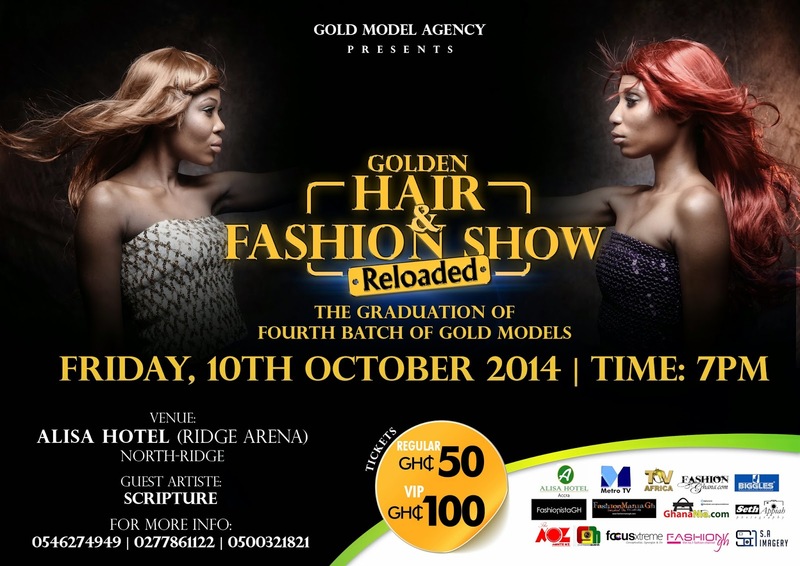 Gold Model Agency have announced date for the graduation of fourth batch of their Models and second edition of Golden Hair & Fashion Show. The event has been scheduled to take place on Friday, 10th of October, 2014 at Alisa Hotel (Ridge Arena Hall), North-ridge, starting from 7pm. Tickets for the event are on sale at 50cedis for regular and 100cedis for VIP. Hair Stylists, Make-up Artistes, and Professional Fashion Photographers in Ghana and beyond all together on one runway and also to mark the successful completion of the Certificate in Modeling Program by the fourth batch of models graduating from Gold Model Agency & School. The celebration of Gold Model Agency & School’s third year anniversary and official launch of the Agency’s website also comprise of the event’s objective. Designs, Manyeyo, Ju’ fedi, and Paulmens Clothing. FashionManiaGh is proud to support this initiative and other media partners are; Metro TV, TV Africa, FashionistaGH, FashionGhana.com, FASHIONgh, Monte OZ, Ghananie.com, Cypressgh, Seth Appiah Photography, S_A_Imagery, Biggles Multimedia and FocusXtreme.